This dynamic and multi-media session challenges participants to “see” the extraordinary within the ordinary… literally and figuratively based on Tom Leu’s principles of Communichology™. 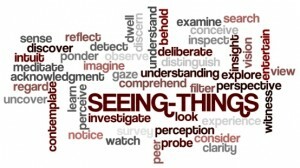 “Seeing things” is about deliberately examining and exploring new perceptual distinctions and their resulting perspective-shiFts of the world around us. **Featuring multiple images shot all across the country from his published photography works, Tom challenges audiences to adjust their perceptions, to gain new perspectives, to have a greater, positive influence on their personal and professional outcomes. Perspectives that if perceived for what they truly are, can open up a whole new, defining world to those paying attention. “Seeing things” from new and unique perspectives can drastically change how we view, interact with, and positively affect the worlds in which we live and work. Recognizing and understanding the important, yet often overlooked differences between perception and perspective provide enhanced outcomes personally and professionally. Applying the practice of “seeing things” ongoing give you an advantage socially and emotionally. Employing the 6 strategies to sharpen your perception that will enable you to “see things” in new ways offer positive affects for both your personal and professional perspectives and outcomes. **For Educators: this talk anchors key Faculty & Staff Development, Team Building, & Leadership principles for all academic and administrative staff. Participants of this presentation will be taken on an insightful and inspirational multi-media journey of discovery using words, images, and music. By learning to look just underneath the obvious, we can illuminate and harness the intricacies and nuances of how our perceptions influence our perspectives, and ultimately shiFt and shape our personal and professional outcomes. “Seeing Things” is an ability, a skill set to develop, and use to your advantage. This presentation is simultaneously an encouragement and an urging to open up your eyes to how we communicate to each other and to ourselves. The best communicators recognize that a conscious decision is required to “see things” for what they’ve been before, what they are now, and what they could be next. Tom Leu, MS/CPC is a Member of the National Speakers Association, a Certified Professional Coach (CPC), and Certified Trainer for the Body Language Institute. Tom is also a professional photographer and host of two radio shows that air in Illinois, Florida, and around the world as on-demand podcasts. Tom is the former Academic Dean at Rockford Career College in Rockford, IL, and previously worked as an Account Manager at McGraw-Hill Higher Education. Researching from a social-psychological perspective, Tom created a new discipline of study called Communichology™ in which he presents from the unique vantage point where communication skills and human psychology collide. Tom is a sought-after speaker on topics pertaining to advanced communications skills, leadership, emotional and social intelligences, body language, persuasion and influence. Tom’s professional career includes nearly three decades of experience as a college administrator & instructor, keynote speaker, corporate trainer & seminar leader, radio & television host, author, & photographer.